This is the final of three posts dedicated to The Second Remembering Barbara Stanwyck Blogathon being held over at In The Good Old Days of Hollywood and Maddy Loves Her Classic Films..
Brief Synopsis – An English Professor doing research on verbal slang meets a singer in a nightclub who uses him to hide away from the police. My Take on it – This is a film that I came across by accident and didn’t expect to like at all. I even assumed it would be the least enjoyable of the 3 that I chose to watch and review for this blogathon. It’s my absolute favorite of the three by far largely de to the high energy that is very prevalent throughout. The concept of the film works really well and thy manage to keep it quite plausible throughout. Barbara Stanwyck and Gary Cooper have great chemistry together here which also helps to keep this film enjoyable. Their characters are quite different, yet they manage to find a way to let the story flow around them. The added use of the 7 Professors also helps this film immensely because they add enough comic relief the entire time. I was extremely amused to read that they correspond to the Seven Dwarves (see Trivia Section below). In some ways, this movie feels like an Americanized version of Pygmalion yet it does similar things with different actions and consequences. I wouldn’t be surprised to lean that this film inspired the concept for the Reality TV show Beauty and the Geek especially since it seems that on paper, this whole concept shouldn’t work but if you watch them, you can see how well it does. 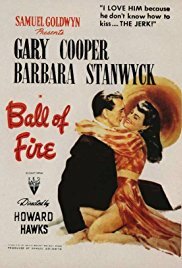 They use a very unique way to deal with the characters in the story and that helps make this film such an enjoyable Screwball Comedy. Stanwyck was nominated for an Oscar for Best Actress for her performance here. Loved the energy level of it all! Bottom Line – Great concept that works really well. Stanwyck and Cooper have amazing chemistry together and despite their characters being so different, they still manage to make it flow. The 7 professors add some nice comic relief and was amused to hear that they correspond to the Seven Dwarves (see trivia below). This film may seem like an American version of Pygmalion yet they make things work in different ways than in that story. This is actually more like it was the original idea for Beauty and the Geek because on paper this shouldn’t work at all. The cleverness of the characters help to move the story along quite well. This is a great screwball comedy because of the unique way that it deals with the characters. Filled with lots of energy throughout. Highly Recommended! Glad you enjoyed this one so much. It’s one of my favourite films of Barbara’s. It’s so funny and she is the main attraction for sure. Thanks so much for joining our blogathon.